IT security assessments should be undertaken for any business that understands the value and importance of its IT infrastructure and to keep ahead of the latest threat developments. Client data, financial information and brand protection are key concerns for any organisation. Performing IT security assessments should be an integral part of your IT security posture. It enables a detailed understanding and quantification of risks posed to your IT infrastructure. 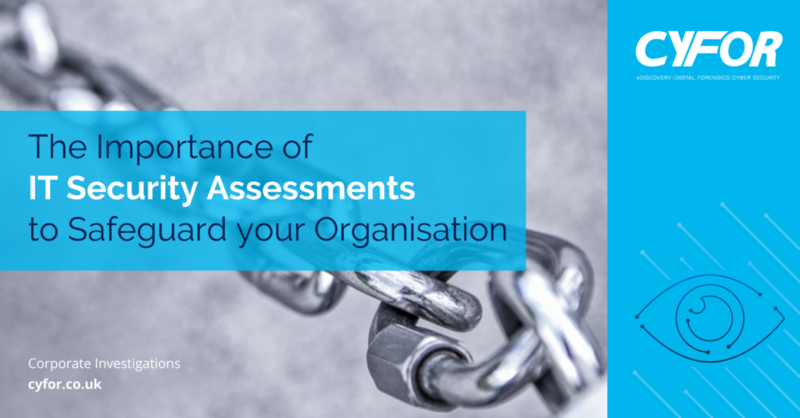 As threats to IT security become more numerous and sophisticated, it takes a comprehensive IT security assessment to understand how these threats – external and internal – can bypass your organisations security measures. Failure to sustain an acceptable level of IT security can incur regulatory backlash. IT security assessments and cyber security audits are security assessments designed to evaluate a business’s IT systems, detailing vulnerabilities and providing advice for remediation. By performing a comprehensive IT security assessment at regular intervals e.g. bi-annually, can help you gain valuable insight into the correct strategies, practices and technologies to implement. This ensures optimal protection for critical business data and confidential client data. Why should you undertake regular assessments? Organisations are obliged to adhere to regulations specific to their individual expertise. However, with the emergence of more broad, stringent regulations, such as the GDPR, and more sophisticated security threats, businesses now understand the importance of improving their IT security. Stay ahead of the latest security risks that possibly threaten your organisation. Determine whether the IT security of your organisation is, or how easily it could be compromised. Identify and address any gaps in security. Improve employee vigilance concerning the IT security of the business. Increase awareness and clarification of potential security issues. Focus on investing in the most beneficial security products, allocating resources to better protect your business and reduce overall costs. Identify any physical security threats in the form of potential danger to facilities or hardware. Identify any software security threats, including network vulnerabilities, malware and viruses, as well as data back-up and disaster recovery. Bring your security strategies into alignment with your business goals. Demonstrate to stakeholders and clients that protecting the integrity of your IT infrastructure, and in turn their data, is high on the agenda. Improve the effectiveness of governance, risk and compliance efforts. Ensure all patching is up to date across your systems.